For those of you that have passed by Lauretta Jean’s because it’s just a pie shop, I need to know what were you thinking? It’s PIE! Second, it’s not just a pie shop, there is so much more or at least I had heard. I was on a mission to find out. This place is just darling, so I chose to invite Debbie from Sweet Bliss to join me. I knew she would enjoy the atmosphere way more than my husband, which she did by the way. 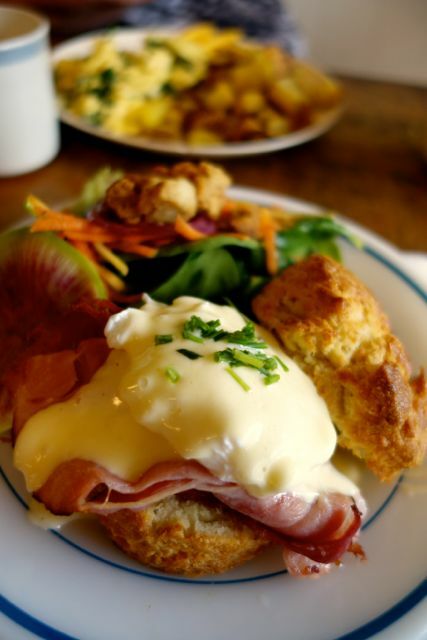 Of course the Eggs Benedict catches my eye, but I was torn when I saw a Brussels Sprout sandwich. The Egg Benedict is served with a biscuit, so I knew I needed to try it and our server said it was a good choice between the two. I honestly think this is the first time I have had one with a biscuit. It was actually a good combo, especially since the biscuit was really good. The hollandaise was good too, very subtle, so not a lot of lemon going on and the smoked ham was perfect. I think my only complaint was that there was only one egg, I wish there had been a second egg on the other half of the biscuit. It was served with a beautiful, lightly dressed salad as you can see. Debbie got a scramble that looked really good and I think she was pleased with her meal as well. We both agreed we do need to go back and try pie. It is a pie shop after all. What’s your favorite pie from Lauretta Jean’s? Atmosphere is very charming. It’s small and on this Saturday morning it was keeping pretty busy. Pricing was $9 for my eggs benedict. They serve Water Avenue Coffee and a really nice loose leaf tea. 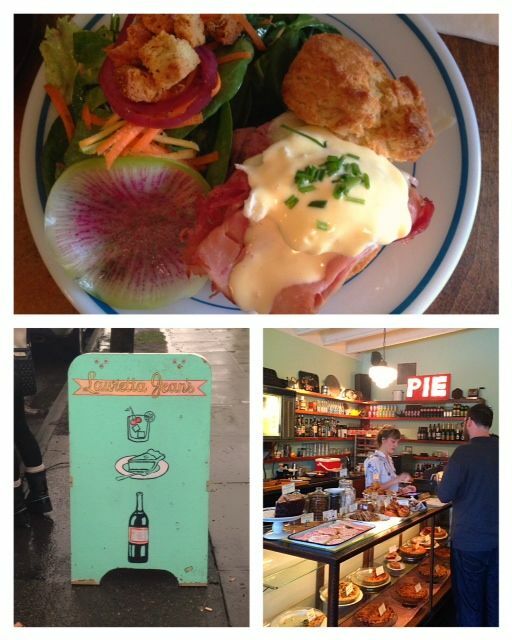 Lauretta Jean’s is located on SE Division St. and they serve breakfast daily. I saw you post these pictures on facebook this weekend and I vowed to go here as soon as possible!